So why Iron man you ask? Well besides the fact that the character recently was revived by Hollywood, Iron man is a very Angular character, and lends himself well to vector art, because of the line and gradient based look of the hero. I’ve broken down the tutorial into four phases, Setup, Linework, Coloring, and Effects. First we need our reference photo, obviously the object of our affection for this project is none other than Tony Stark Himself, Iron Man. Click here to download the Hi-Res Iron Man Photo. Now we need to make a new Illustrator file, 3500pts Wide and 2500pts Tall. You can use these doc settings. Now It’s time to place in our Iron man Pic. Place the Jpeg into the stage, you’ll notice how tiny he is, since this pic has plenty of pixels we’re going to ramp it up. Select our Iron Man image and scale it up to 520% of its original size, and make it a uniform scale, so that you keep in proportion. Now we have a much larger Iron man, and we need to align him, set you’re alignment at the top to the stage, with center, and bottom align. Name you’re layer Iron Man and lock it, this is our reference Double click the layer, name it and lock it, you can also do this from the Layers Pallette. Finally Save the file, and be sure to set it to include linked files inside of the save dialogue box, this will increase file size but keep the image in the file while you’re working on it. Now we’re down to the nitty gritty, it’s time to trace, and trace, and click, and click. This process will take different amounts of time for each person. Some strategies I like to use is create simple “whole” shapes (like the outline of the head) and then create the line work that will serve as “cutouts” of the original shape. Confused? Let me show you an example. This is where I chose to start my file at the chin, once you’ve completed a shape like this, it’s a good practice to hit “V” then “P” again on your keyboard, to deselect the path you’re working on (especially if its not a complete path) and then go back to the pen tool, now I’d draw a line diagonally following that highlight to “cut” the chin shape into three segments. 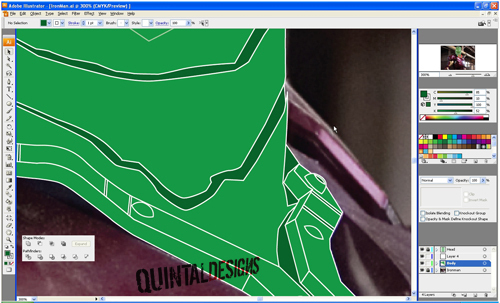 For the sake of visual separation, fill in your white outlines with a color, something different from Ironman’s colors. Green suits well. Since I cannot train you on the pen tool, I will provide you with reference, and give you some general tips. Not I’ve not worried about cleaning up lines, That’s something you can worry about later, you can however use the divide tool to “cut up” the different shapes and sections of the design. Now this is going to leave you with a lot of junk shapes, and not nessary lines inside your design, so why do I do it? Time! It’s much faster to stray out of the lines and then worry about cleanup, then it is to make every shape exactly aligned and layered. This is a great technique and will save you time. Stop once you’ve traced out the head, It’s time to polish up your paths. 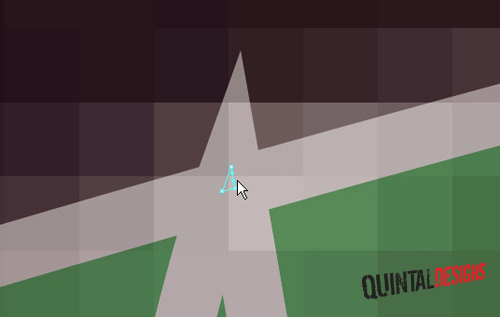 Once you’ve got the shaped down and dirty, It’s time to do some cleanup, Use the pathfinder again by selecting paths that should go together and were separated during the divide process, holding the ALT key on your keyboard, and clicking the “add to shape” button in the pathfinder, this command adds shapes together and makes them one object. NOTE: Sometimes the add to shape area command will “group” items for no reason, if you cannot change the transparency of one particular path or part of your design, check to ensure it’s not grouped. Here’s a look at the left “mouth” part of Iron Man’s face, before and after cleanup. Also, Look for lines that stick out, these little guys are tricky, here’s an example. Now! After plenty of hard work you should have a decent looking Iron Man Head. Whew, Tired yet? Too bad! Now you have to rinse and repeat, lock down that head layer, and put another layer under it, this will be our body. Usually I refrain from using layers in Illustrator, but our subject is particularly complex today, so we’re going in for it. This is only going to get done piece by piece, exercise patience, and stay methodical, There’s a lot to do. You can Start to break up sections of the design with a darker green, this helps you remember just what the hell section you’re working on and is good if you forget something along the way. Separate out Areas like highlights, this is with the foresight that we’ll need to actually “highlight” or color them differently later on. Now it’s time to color Iron Man, If you’d like to jump straight to this point, you can download this outline only version I’ve created. The first step is reletiavly simple, make nine squares. Why you ask? Because Tony Stark’s costume really only has 3 colors in it, and for our gradients we want to represent lighting of sorts to give it a “3D” look. Make nine boxes in illustrator on a separate layer, hide your design, and then use the eye dropper tool to sample a light, mid-tone and dark color of each of the three iron man suit colors, Red, Gold, and Silver. Here’s the palette I got after sampling the image. Now, You’re more than welcome to change any one of these colors, personally I found the movie version of the suit, to be a bit too purple in this instance, but I did not stray from it, Later on I’ll show you a version with different color. Keep in mind that this is really just a launching pad for coloring the entire design. Color Tony Stark! Use the mid tone of each to color in Iron Man’s separate parts, for the areas that are black I suggest using the darkest red tone. I made the eyes and chest blue to remind me they are different. Now, It’s time to create our gradients. Open up the gradients palette, and select the “blades” to the left side of Iron Man’s chest. 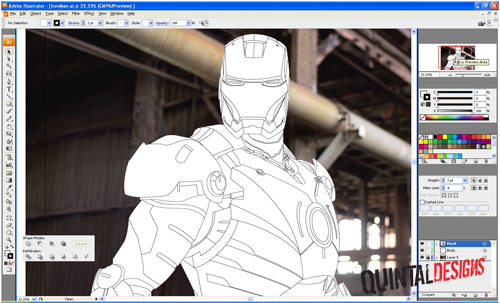 Notice I’ve made a copy of the iron man picture, This will sit under your design, and you can shrink it and move it around to it serves as a point of reference for coloring and shading Iron man. Now eye-dripper the brightest color and drag it into the gradient palette, Repeat again, eye-dropper the mid tone and drag that swatch into the gradient palette, and then the darks. Here’s a visual example of the drag. Once you’ve added in your colors you can grab little swatches you don’t need (the black and white one’s usually) and drag them down to make them leave the gradient palette. Now you’ll see those colors added to our objects. For this section of the suit, Iron man has a bright “spot” where the light shines, feel free to make your gradient radial instead of Linear, you can change that in the Type menu of the gradient palette. Select the gradient tool from the toolbox in illustrator, and drag it to highlight the correct area of iron man, you can adjust your sliders to match. I’ve also hidden the background image at this point, as it only serves as a distraction. You can now select solid areas of the design, and use the eye-dropper to sample the gradient that you’ve already created, some will set up the gradient as a swatch, but there’s no real need for that. Continue on with the Gold and the Silver, You Keep your reference photo close, and you should be fine, basically we’re simply representing 3D space through use of light and shading. Once you have all the gradients done, You’re now free to use the magic want tool and select, say, all of the red gradients, and select one of the swatches and change the color values, here’s a look at Iron Man in a more classic red, next to his more movie color counterpart. Once you have all the coloring done, keeping the stoke on is up to you, I turned if off in this photo. Throw a simple gradient box in the background and you’re ready to polish this up. Ok Iron man is almost done except for 2 things. The eyes and that super glowing chest thingy! Before we take this step, please note, this created a much larger file. If you don’t have a lot of ram, or don’t want to wait for you illustrator file to load, I suggest making a copy of the file before continuing. Lets start with the eyes. We’re going to make them white, as the brightest part of the glow is white. Once you’ve got them white lets throw on an outer glow. Go to Effect>Stylize>Outer Glow. Looks nice eh? No, not bright enough? I know you’ll need a second one open up the Appearance palette, and drag the outer glow down the the little piece of paper to duplicate the glow. Now double click the second glow and change it’s properties. Depending on how you like it you may want to try different colors or settings. Here the one’s I used. Now do the same for the chest piece, You can pretty much rinse and repeat, you may want to increase the blur level to make it cover more ground. After all is said and done, you should have yourself a pretty legit Iron Man! Since it’s not often done, I’d like to say if you finished this tutorial well done! I’m sure you put in a lot of time and effort. Please post and questions, concerns, clarifications and corrections so that I can make this tutorial even better.